Description: OpenSS7 Hardware Selection T100P/E100P. The T100P and E100P cards are 1- T1 or E1 port PCI cards manufactured by Digium. The figure below shows a picture of a T100P card. The T/E100P cards have the lowest level of signalling performance due to the lack of on-board HDLC functions. Transfers to the host processor over the PCI bus use PCI I/O ports and memory mapping. The function of the T/E100P Channel driver is to provide for the termination of 2.048Mbps, 1.544Mbps, 64kbps and 56kbps digital paths. This driver provides direct access to the channelized or unchannelized T1 or E1 digital paths to OpenSS7 media and signalling protocol modules as well as providing T1 or E1 management, framing, coding, alarms, and synchronization. 1 T1 or E1 span per card. 32 channels per card (E1). 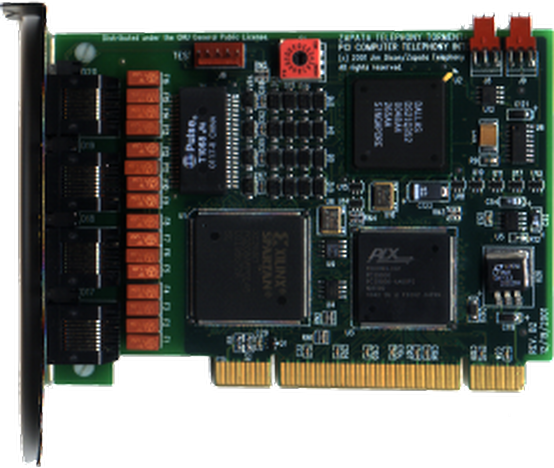 Ultimately, the performance limiting factor of the T/E100P cards is the bandwidth of the PCI bus and the ability of the processor to perform Soft-HDLC and TDM switching in software. A 350MHz processor is capable of processing the bandwidth of an entire E100P card (32 signalling links) with a combined link throughput of 2.048 Mbps. For the OpenSS7 VoIP Switch, this performance is too small and does not scale. A medium grade 2GHz PC should be capable of handling 8 cards (248 SS7 links) with adequate excess capacity available for background operations. These cards are cost-effective and can provide 64kbps SS7 links at average incremental interface cost of approximately $8.00 USD per signalling link.